These should hopefully be quite intuitive. The secondary points are also intuitive but less obvious, and deserve to be stated in full. First, pattern combinations will be far easier if the tie is the largest, boldest or least dense pattern. It needs to stand out. As the most prominent and central element to the outfit, its pattern will look best when thrusting itself forward, against the background of the shirt. A strongly striped shirt and micro-patterned tie may be ok in theory (they certainly won’t clash), but the tie could easily get lost. Best in that situation to go for a plain tie, or one that benefits from both a bold and different pattern, such as a large polka dot. The image from the previous post, reproduced here, demonstrates this amply. Not only is the tie a sufficiently different pattern from its neighbours, its strength also naturally lets the tie fulfil its central role. The same principle applies to a pocket handkerchief, if worn. If the hankie is patterned, it needs to be a large, strong pattern to stand out from a patterned jacket. A subtle woollen hankie against a bold city pinstripe is unlikely to work. Two more quick points on hankies. If the suit is plain, don’t worry about the size of the pattern, just as you wouldn’t with a tie. But, if you are wearing both a hankie and tie, best to let the hankie play a minor role. Only a plain tie would be a sufficiently neutral partner to a bold handkerchief. The only other advice worth giving is: if in doubt, go for a plain shirt. Mixing patterns is great when it goes well but, as mentioned last time, it is also one of the first ways men go wrong. 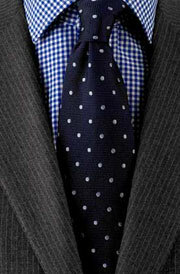 If you are unsure about the patterns’ suitability next to each other on your chest, pick a plain blue or white shirt. Then the tie and suit can go wild. You can follow the discussion on Density of pattern, part 2 by entering your email address in the box below. You will then receive an email every time a new comment is added. These will also contain a link to a page where you can stop the alerts, and remove all of your related data from the site. Brilliant advice – most men are clueless about this sort of thing as it’s an easy one to get wrong.